Private grounds with pond, out-door lounges, hammocks. organic vegetable garden, olive and fruit orchards. Maid service 2 times x week. The house is located in the countryside between the towns of Acquapendente and San Casciano, near the hamlet of Trevinano, at the border of Tuscany and Umbria. See map below. At Podere Palazzo you can indulge in the most relaxing and special vacation you will ever have. The house is a unique rental villa at the border of Tuscany, Umbria and Lazio, midway between Rome and Florence and convenient to many of the most charming towns and villages of central Italy. Situated atop a hill with expansive views, this vacation home is surrounded by the unspoiled beauty of the rural Tuscan landscape with its magnificent oak woods, beautiful mountains, peaceful pastures, classic olive orchards and vineyards, and delightful medieval towns. Podere Palazzo has been beautifully restored by an Italian architect working with skilled local craftsmen. It combines the beauty of a traditional stone farm house with the best of Italian modern interior design to create a unique blend of the old and the new. This spacious and airy villa, measuring 4,000 square feet (370 square meters), has five bedrooms, four and a half baths, splendid grounds including a pond, an infinity pool, and a portico for outdoor dining. It can serve as a home base for a family or group of friends who want to explore all the beauty and history that central Italy has to offer and to enjoy outdoor activities like hiking, horseback riding, sailing, cycling, windsurfing and much more. Just down the road from the house is one of the largest and most popular spas in Italy where there are delightful thermal pools and a world class assortment of spa services. For those who just want to relax, Podere Palazzo is a tranquil oasis to sit by the pool, read a good book, or nap. The house is available on a weekly basis from Saturday to Saturday, year round, and for long weekends in low & shoulder seasons. Please submit your reservation request and we will confirm availability and price. Rates are inclusive of house cleaning, all utilities, Wi-Fi, bed linens, all towels including pool towels, soaps, detergents, bathroom amenities. Rates do not include house heating in low & shoulder season. Rates listed are for occupancy of 10. Fees apply for 2 extra people in twin beds. Orvieto (30 min. ): Etruscan & Roman archeological sites, 12th century gothic cathedral, medieval quarter, shopping, great restaurants. Bolsena and surroundings (20 min. ): Historic town of Bolsena, fishing village of Marta, Montefiascone as well as Lake activities and boat tours. Pienza and Montepulciano (30 min. ): beautiful medieval and renaissance churches, charming streets, great shopping and restaurants, famous for wine and cheese, museums. Pitigliano, Sorano, Sovana (30 min. ): Unique towns with medieval history, Etruscan sites and tombs, Jewish history, shops and restaurants. 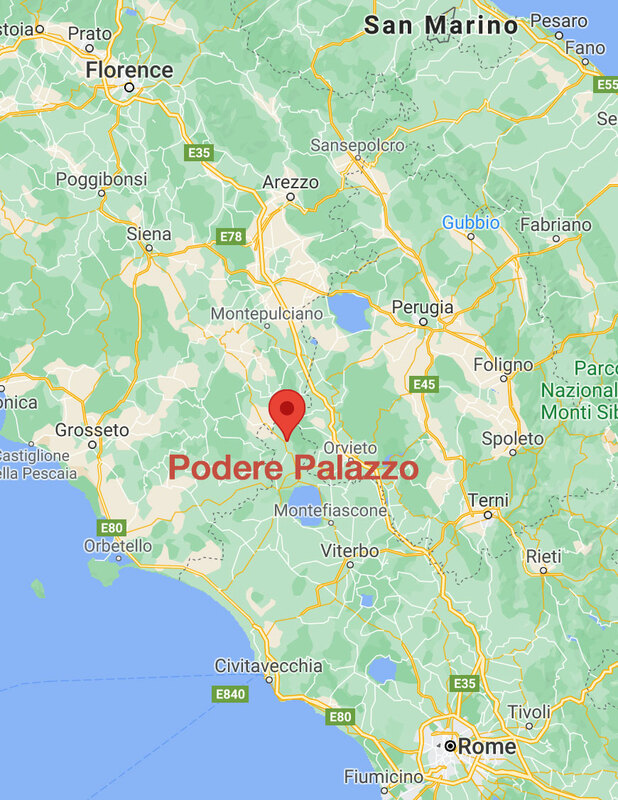 We would be happy to assisit you in planning your stay at Podere Palazzo to make it a special vacation. Ask us about how we can help you scheduling any of the services listed above as well as advice on best itineraries and places to visit.